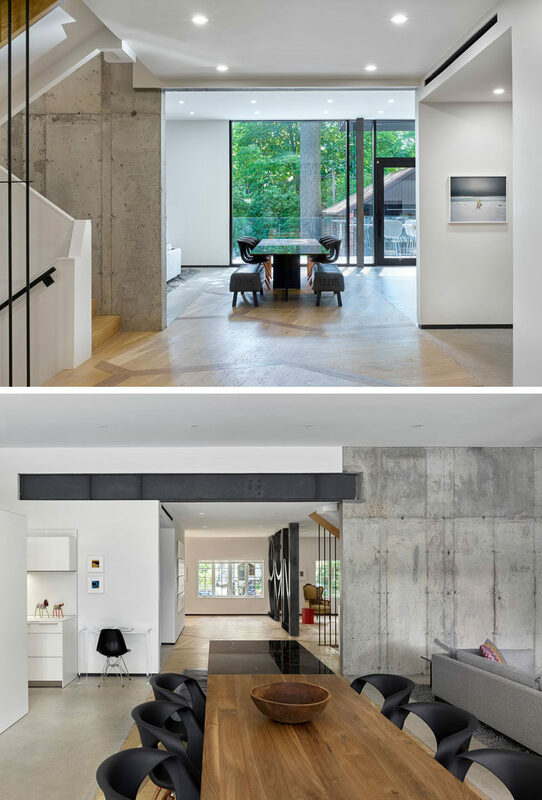 Architecture and interior design firm Audax have updated a 116 year old home for a family in Toronto, Canada, and added a contemporary extension to the rear of the home. 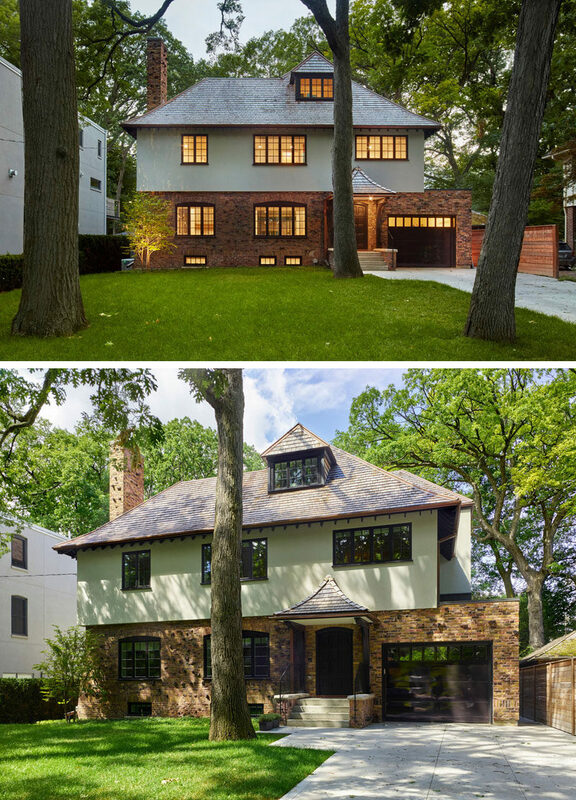 On the front of the house, the designers reconstructed the heritage facade and integrated a garage in to the design. 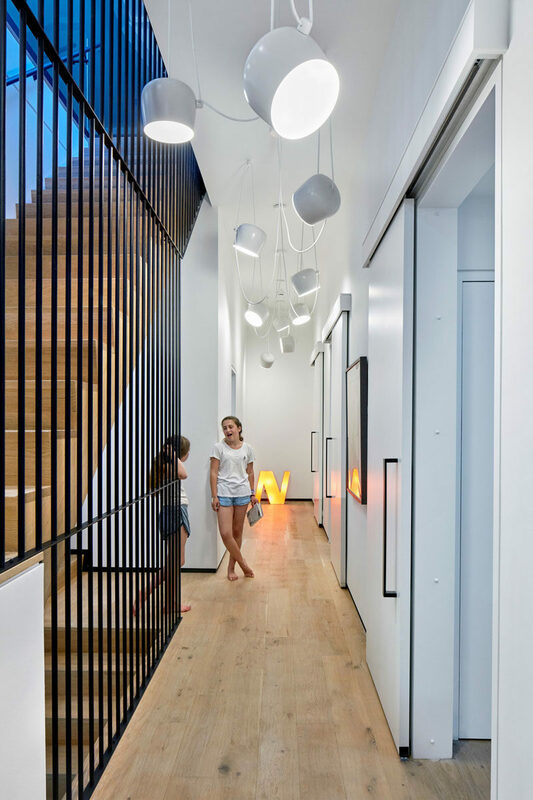 Entering the home you walk through the original front door and are greeted by a foyer with a minimalist gallery-like interior. 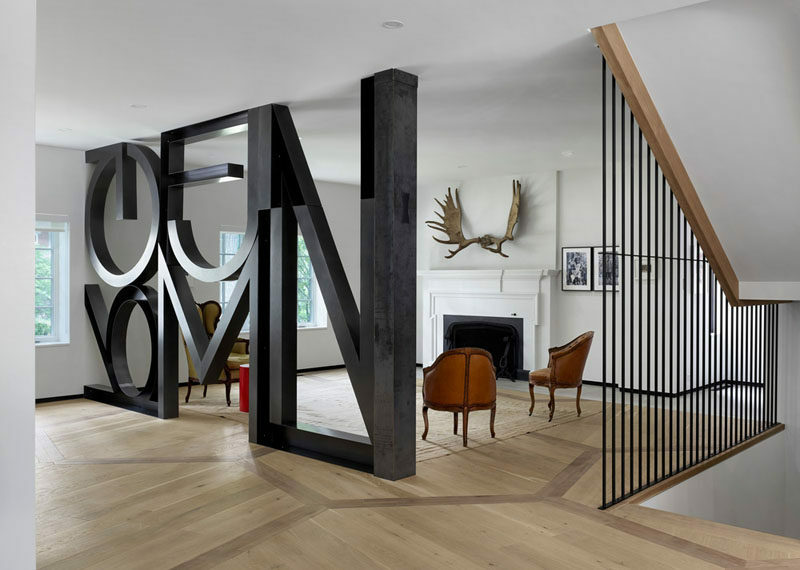 Around the corner from the entrance is the formal living room that feature a word art installation by Commute Design. The home owners use this heritage part of the home to display their collection of vintage chairs. The traditional wood flooring flows from the heritage part of the house through to the dining room and the new contemporary extension. 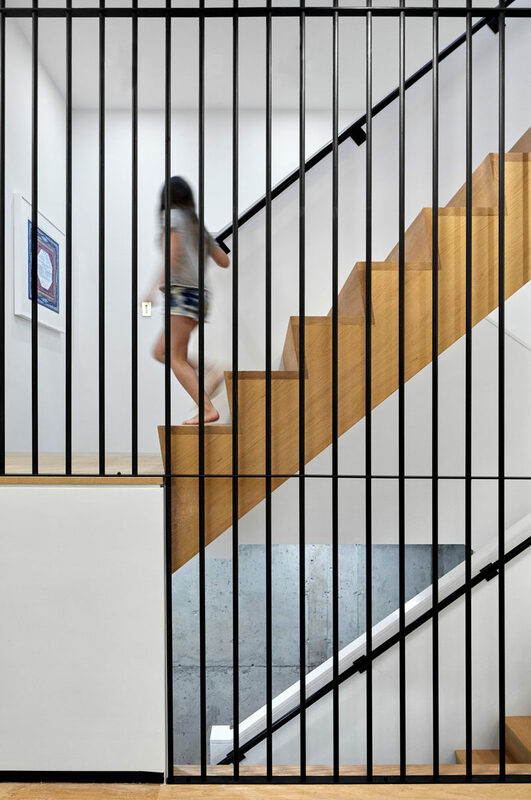 Either side of the wood flooring is flanked by polished concrete flooring. A long dining table divides the open floor plan. 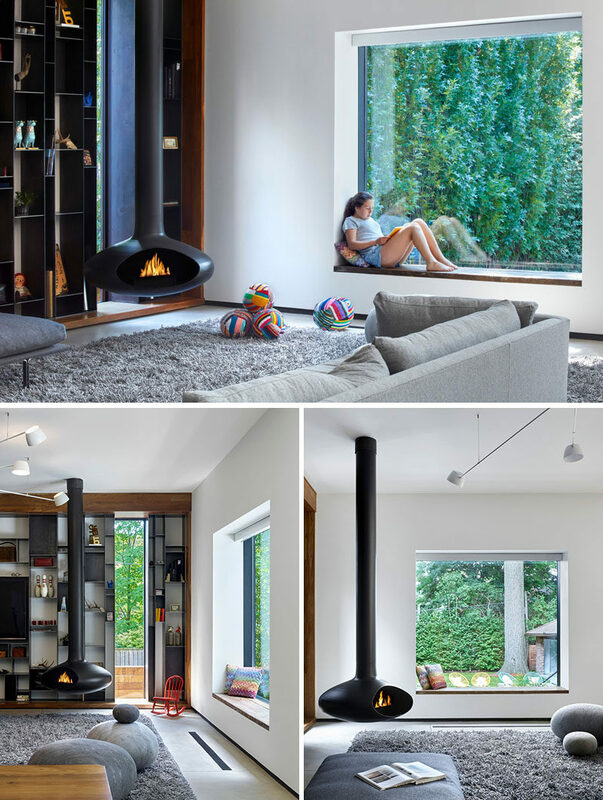 On one end is the family room with a custom designed metal bookcase and a suspended black wood-burning fireplace. There’s a modern bay window with a wooden window seat to match the dining table. Patterned pillows add comfort and a touch of color to the space. On the other side of the dining table is the mostly white kitchen, that was modeled after the look and feel of a showroom kitchen. Off the kitchen and dining area is the backyard where you can see the new rear facade of the home with expansive floor-to-ceiling windows. A new terrace and pool was added and is surrounded by large mature trees. The home’s original garage was transformed into a pool cabana and games room. Looking back at the home, you can see a peaked gable end which is consistent with the architecture of other homes in the neighborhood. Heading back inside, the stairs in the middle of the home separate the old and the new. Upstairs there are three kids bedrooms with each of them accessed by identical sliding doors. Hanging white lights make sure the hallway is bright. Here’s a look at one of three children bedrooms that’s inside the heritage portion of the home and features an original fireplace. 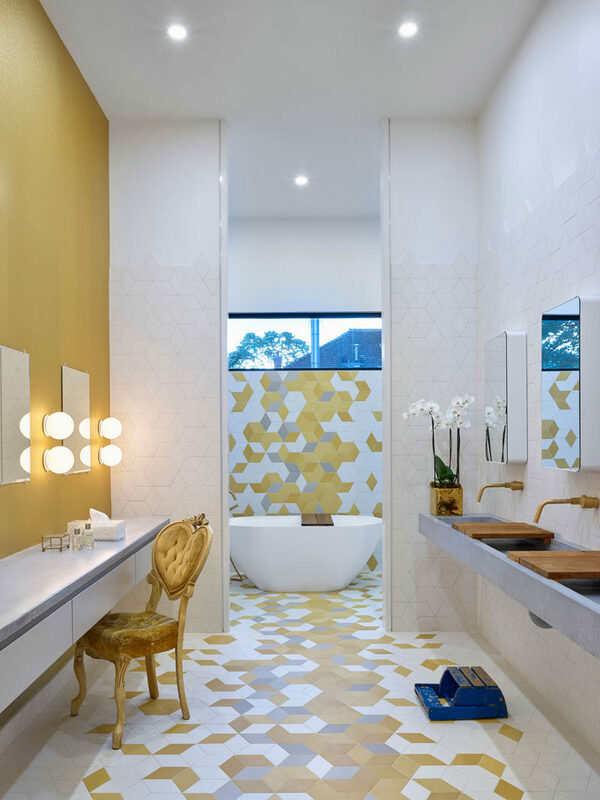 The three daughters all share a bathroom that has three sinks, three makeup stations and fun colorful geometric tiles. 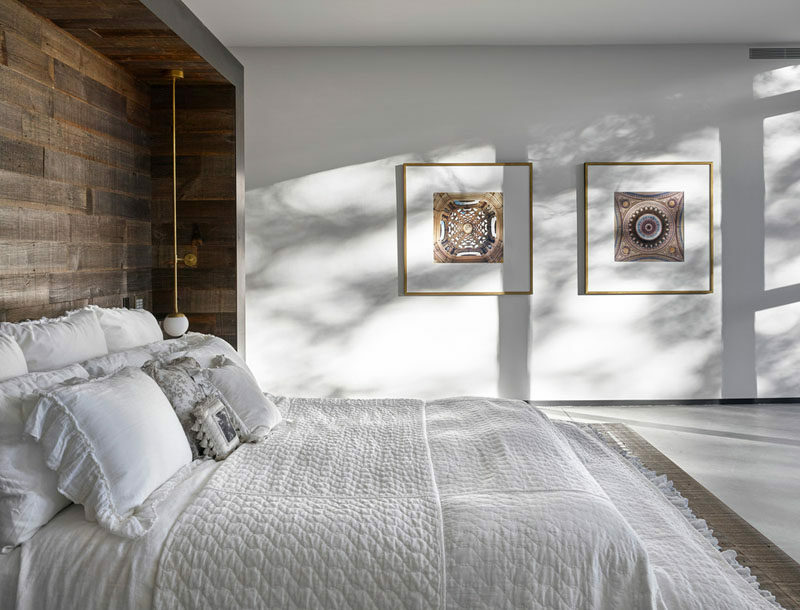 The master bedroom, with a wood feature wall, is located within the new addition and looks out towards the backyard with large windows providing framed views of the treetops. Large windows are also present in the master ensuite, however a sliding frosted glass privacy panel can be used when needed. A wall of vintage mirrors collected by the home owner is also displayed in the bathroom. 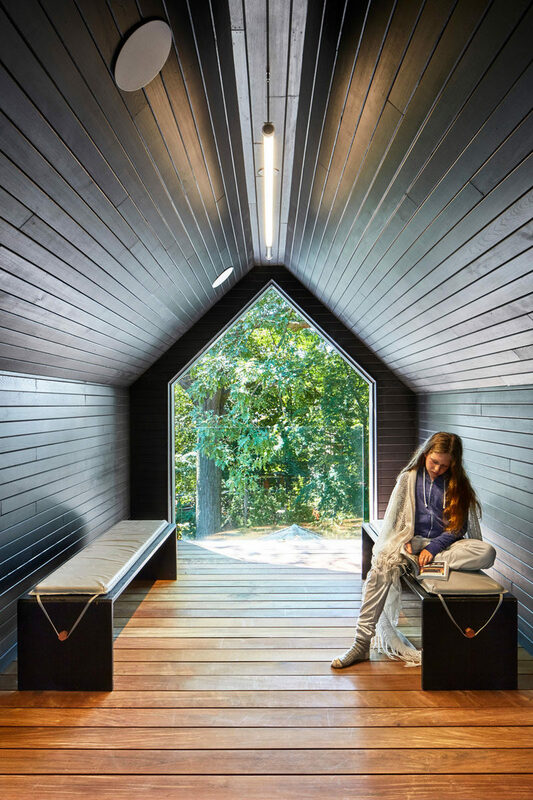 A small wood-lined room has been added into the gable of the extension and provides a quiet retreat on the third floor of the home. The home also has a basement that is reached by the main staircase. In the basement there’s another bathroom, this time it’s modeled after a school washroom and features a classic bathroom stall look with a communal sink that has a foot pedal faucet.